If you have never played The World Ends With You before, the Nintendo Switch version released on Thursday night is not a bad way to get into it. Final Remix retains the game’s great sense of humor, its fantastic music, and Tetsuya Nomura’s most restrained character designs. But if you have played it before—say, if you’re a big fan of the original 2007 Nintendo DS version, like me—you will most likely be disappointed by the Switch port. All the best elements of the game--the character writing, music, and character design--are intact. The touch screen and motion controls ruin the game's core message. Also, it's just plain boring. I can’t see anyone getting that obsessed with the Switch version of the game. It’s less a port of the DS version than a port of the mobile version of the game, meaning it uses the mobile port’s touch-screen controls. There’s no real way to get around them. When the Joy-Cons are attached to the console, they simply stop working. You have to use the touch screen. When the Switch is docked and the Joy-Con are detached, you have to use motion controls that mimic the gestures you’d be making on the touch screen with your finger. I tried to play the game that way, but it’s simply atrocious. If you’re lucky enough to find a comfortable position to hold your hand in while you’re swinging around a Joy-Con, getting the game to recognize some of the more delicate motions you make is a struggle. Not that it’s any easier when you use the touch screen. After playing through the game’s story I realized that there’s about a half-second delay on any gesture you make on the touch screen. Attacks in this game are determined by pins you win off enemies or buy, and different pins use different gestures to trigger their attacks. Some of the attacks that Neku uses require you to do things like draw a circle on the screen. Because it takes a moment for the game to register that you’re making a circle, and in that time enemies are attacking you, using attacks like those are just not very feasible. You’re better off just getting a couple pins that fire projectiles, not moving from the center of the screen, and then calling down your partner when those pins are on a cooldown. 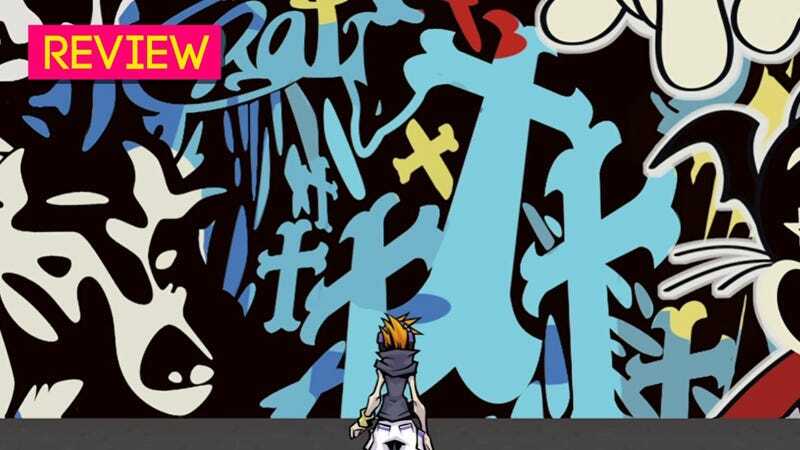 If you’ve never played The World Ends With You before, maybe these things won’t bother you. If you’re a returning player, however, it’s hard to ignore. There’s not much new content, either. The allure of a new storyline mission, called A New Day, was all that kept me going ‘til the end of the game. There are some neat features in this new mode, like battles that impose novel challenges. Sometimes enemies will split and multiply while you fight, making you defeat them quickly. 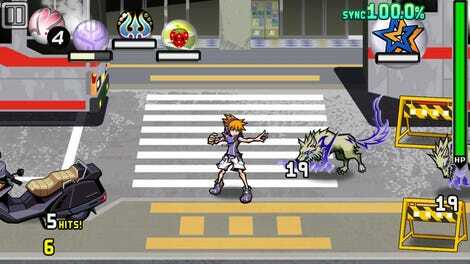 Other times, Neku’s health drains over the course of the battle but he can regain health by defeating monsters. However, once I realized that this scenario reused a boss fight from the main game, I decided I wanted to put it down for a while. Although the game allows you to retry any fight—including boss fights—on the easy difficulty so that you can just enjoy the narrative, I didn’t really feel like engaging with the same content from the main game a second time.